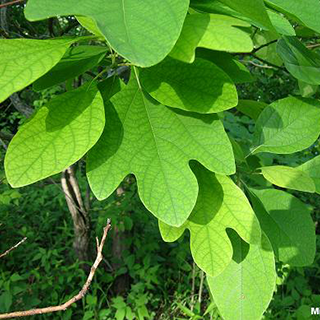 A native of the United States and Canada, sweet Sassafras is ofter used in blends for its flavour, cleansing nature, and aromatic value. It's a good tea to take for a hangover, because it quickly moves toxins out of your blood, and it's an anodyne for pain relief. It's a time honoured tea for rheumatism and gout. Boil about 2 to 4 ounces (56-100g) of this bark in a quart of water (950ml) for twenty minutes or so and then allow it to steep until it cools. The oil is said to relieve the pain caused by menstrual obstructions, and pain following parturition, in doses of 5 to 10 drops on sugar, the same dose having been found useful in gleet and gonorrhoea. Note: The oil can produce marked narcotic poisoning, and death by causing widespread fatty degeneration of the heart, liver, and kidneys, or, in a larger dose, by great depression of the circulation, followed by a centric paralysis of respiration. Sassafras roots will need to be dug from a sassafras tree in spring and dried.